the Ghegs resemble Kosovar Albanians in having a higher frequency of E1b1b1. Tosks on the other hand have a higher frequency of I. The high J2 frequency resembles Greeks, with the expected 10 to 1 or so ratio between J2 and J1, and is dissimilar from northwestern Balkan populations. Past studies have shown however, that J2b is dominant in Albanian, rather than J2a which is dominant in most Greek populations tested so far (although J2b is also represented). Similar frequencies to Greeks are also found in R1. There is also a relative paucity of G compared to Greeks, and limited introgression of Gypsy chromosomes (H1) in the main Albanian groups (Gheg and Tosk). Y chromosome variation at 12 STR (the Powerplex® Y system core set) and 18 binary markers was investigated in two major (the Ghegs and the Tosks) and two minor (the Gabels and the Jevgs) populations from Albania (Southern Balkans). The large proportion of haplotypes shared within and between groups makes the Powerplex 12-locus set inadequate to ensure a suitable power of discrimination for the forensic practice. At least 85% of Y lineages in the Jevgs, the cultural minority claiming an Egyptian descent, turned out to be of either Roma or Balkan ancestry. They also showed unequivocal signs of a common genetic history with the Gabels, the other Albanian minority practising social and cultural Roma traditions. At least 85% of Y lineages in the Jevgs, the cultural minority claiming an Egyptian descent, turned out to be of either Roma or Balkan ancestry. They also showed unequivocal signs of a common genetic history with the Gabels, the other Albanian minority practising social and cultural Roma traditions. Easily explained with the formerly widespread erroneous belief in Europe and the Middle East that the Roma people originated in Egypt (hence the names Gypsy, Gitan, Qibti/Kipti (Kopti) and many other variants). Rather than a North/South (Gegh/Tosk) exploration, I'd be more interested in knowing about the coast/highland differences. Because in the Neolithic coastal "Albanians" were participant in the Cardium Pottery culture (and IMO are the most likely source of some of the lineages involved in the migration), instead highland "Albanians" belonged to the standard Red-White Pottery Neolithic of most of the Balcans and later also in the Black-Beige Dimini-Vinca cultural area. These probably spread their genes very limitedly, as they were a very localized subculture. Anyhow, what this shows is that Albanians as a whole have in aboundance all the typical Mediterranean Neolithic lineages, except G: J2b, E1b1b1 and I.
only Dienekes and some other ultra-nationalists can claim that who is living today in an area was always there. Take Athens for example, by 1800's it was a small Albanian village. Where did the people that chilled with Pericles go? Through the 2000-3000 year history people moved based on threats and availability of resources. The last names for Himariotes are something like Gjipali, Gjodeda that are found in the Catholic North. Their language paterns and traditions also confirm that. No: people remained almost everywhere. Dienekes in fact is the kind of author who always claims replacement everywhere (except in Greece? ), but peasants don't move much, and peasants were in the past always about 90% of the population everywhere. Most of the rest were artisans. People change language but land ownership or even mere right of use is generally inherited. And anyhow, what could a penniless peasant do if he loses the land or the right to cultivate it? Some historians imagine migrations, people live generation after generation in the same district. They change language but seldom migrate. >> only Dienekes and some other ultra-nationalists can claim that who is living today in an area was always there. Take Athens for example, by 1800's it was a small Albanian village. First of all it is inaccurate that Athens was an "Albanian" village. There were certain Arvanites in ATTICA in the 1800s, but they were a minority and they were certainly not "Albanians". Second, I have never made an argument for genetic continuity in the small-scale (e.g., Athens), rather the opposite. In the small-scale genetic discontinuity is almost certain, especially when the place in question is surrounded by people of the same ethnic group and any political borders collapse. So, while ancient Athens was to a large extent a relatively closed society which might have had its own genetic distinctiveness, after its loss of independence the conditions for it to remain isolated were no longer there and it melted into the sea of the overall Greek gene pool, both taking and giving genetic material from that broader pool. Kinda puts a damper on their Illyrian pretensions. "Kinda puts a damper on their Illyrian pretensions". Why? If they were there in the Neolithic, they were also there in the Illyrian period, where they might have adopted the language. However, I am of the opinion that Albanian is way too high in the IE phylogeny to be Illyrian, if we accept the usual interpretation of Illyrian culture being related to Celtic and Italic and in general Western IE via Hallstatt/CUs. IMO Albanian language is older than that and should have arrived to the area earlier and/or from another branch. The late Chalcolithic/Early Bronze of the Balcans is complex enough (lots of different resulting cultures after the Kurgan invasions) to allow for that but there's no simple explanation I can think of. It would mean in any case that some Illyrians probably spoke proto-Albanian, regardless of whether this proto-Albanian is identical to other Illyrian languages/dialects or almost totally unrelated. Alternatively it might be, as some have suggested a branch of Traco-Dacian arrived only in the Middle Ages. However it's extremely difficult to explain why the people would accept such language when the dominant ones were Latin, Greek and Slavic by then. Also the classical explanation of Armenians being Phrygian colonists and hence related to Thracians would clash with that Thracian origin hypothesis. I have sometimes, inspired by the Albanian oddity, flirted with the idea that the language of Vinca-Dimini might have been an early offshoot of IE but the archaeological record suggests a "Syrian" origin and there's no such old IE in the area (Hattic, Etruscan are not). Also Albanian can't be the language of CP Neolithic peoples, at least if one argues for them to be at the origin of Iberian language (and even Basque language) because these languages are clearly not IE either. First of all, we don't know where "they" were in the Neolithic, and we certainly don't know that the present-day Albanians were in present-day Albania during the Illyrian period. Second, if their language turned out to be of Illyrian origin (doubtful), it would be a reasonable conclusion that they indeed ADOPTED the language, as the Illyrians were reckoned to be one of the northern nations, which doesn't harmonize very well with the predominantly Southern gene pool of present-day Albanians. Illyrian or not I find them the best candidate for the Cardium Pottery gene pool (J2b, Eb1b1-V13, I2a) that is found in Italy, France, Iberia and even Britain. The fact that Apulia is just across the strait makes the beginnings of that migration even more likely. It'd be interesting to find out if their 20% R1 is (mostly) R1b1b2 (xR1b1b2a1). Isn't Y haplogroup G also a Mediterranean (and also Caucasian) Neolithic lineage? Its only difference from the other Mediterranean Neolithic lineages is its relatively limited impact in the Mediterranean Basin (not so in the Caucasus area and in much of Anatolia). G (G2a, I think) is relatively important in the Iberian Peninsula, it compares well with other presumably Neolithic elements being on average c. 5%. In Italy it's like 10%, also Sardinia and Corsica. The source for this lineage is probably not in the Balcans (too low frequencies) but further East (Cyprus, Levant, Anatolia). It might be a Chalcolithic flow, a secondary input into CP Neolithic (either of these from Cyprus or Anatolia, I guess) or Medieval Jewish impact. Medieval Jewish impact maybe can explain the current distribution levels of the haplogroup G in Iberia, but surely cannot explain its current distribution levels in relatively isolated places like Sardinia (~15% hg G). Also I don't think Jews would have made such a big impact in the rest of Italy (~7% hg G), Corsica and many other places in the Mediterranean Basin and also Central Europe. On second thought, Onur, I really can't think of Jewish impact as any main causant. Because you can see in that map how Sephardic Jews have like 25% of J1 and Iberians almost zero. But a Cypriot origin may make some sense. I suspect that Cyprus might have been, maybe with some nearby areas, at the origin of the Chalcolithic innovations in Iberia... and Sardinia (after all the Nuraghe, like the Motillas of La Mancha have a tholos-like architecture). I can't say re. mainland Italy though, but they must be related. Alternatively, it could be a lineage that CP carriers picked in Italy where it was from earlier times. This also makes good sense. I'd like to have a closer look at this paper and the above comments. I'm in the midst of something so probably won't get to it until later this week. As I've mentioned before, my husband is from a traditional Greek village which is less than 50 miles south of the Albanian border. We visit there for an extended period every two years or so. Even having visited this area many times, the whole place humbles me in its complexity. I would highly suggest to anyone interested in this part of the world that you go there. You can't begin to understand the place unless you can visualize its geography. Maju, have you looked at the archeological find in Dimini, on Lake Kastoria, which I mentioned several months ago? It would be interesting to know in which archeological group that belongs. Maju, the Sephardic Y haplogroup composition in the map you linked has no resemblance to the Iberian compositions at all. Sephardim seem to be typical Eastern Mediterraneans, with much more resemblance to Greeks, Turks, Caucasians and Middle Eastern Arabs. One oddity is their unusually low (for any European and Western Asian population) distribution of the haplogroup I. This is almost certainly due to genetic drift. I read somewhere that the peasant/artisan ratio of 9/1 could only be reached by Classical Athens (5th-4th centuries BCE) among all pre-industrial Greek settlements of Greece in Greek history. So the general peasant ratio should be more than 90% (maybe more than 95%) in pre-industrial times. Re peasants moving/not moving, could I just give you the case of C19 England. Until the C18 the rural population had been static, but changes in the law on land tenure (Enclosure) led to a different type of rural economy/ society. In Dorset (Thomas Hardy novels) it is now estimated that up to 25% of agricultural workers did move each year in C19, depending on the state of the economy. Some were skilled workers who found a better job but most were the unskilled rural "underclass". They now had no security of tenure, no "feudal" rights and simply lost their job and therefore also their house at the end of their one-year contract. The man would go the "hiring fair" wearing his white smock to show he needed work. Would be hired by a farmer from somewhere else and he and his family would walk to their new village with all their possessions in a handcart. If he didnt succeed in getting a job they would either go to an urban slum (probably outside Dorset) or sometimes go to the uncultivated heathland where there was still common land and try to set up a smallholding themselves. What I mean by this is that one cant make assumptions about how stable village societies were without really studying the individual case. I would guess that peoples of the Southern Pindos have been relatively in place for at least 500 years, at least since the Ottomans overran Constantinople. I'd also suspect that most of the population is much older than this and could in fact be largely in place since Neolithic times. This excepts the documented migrations, in and out, during the 20th century. Matt, your examples from England are from the industrial period. Before the Industrial Revolution, rural populations were much much more stable. I made a boo, boo. It's interesting because of its position on the central Macedonian plain which I suspect was an ancient highway up and down the Balkans. I've noticed from some of your posts that you are interested in Jewish history. There is a really interesting book "Salonica, City of Ghosts" by Mark Mazower that you might enjoy. There was also a traditional jewish community in Yannina, in Epiros, that was involved in silverworking. It seems to have been very rare for Jewish peoples to push into the villages of the mountains, but they did occupy a position of respect in the trading centers of Northern Greece and probably Albania. Closest ie branch to Albanian could be Celtic. I think Albanian music,clothes,foods,dances and traditions are somehow similar to Syrian Arabs(Arab/Arvan=westeners in Semitic)of the coast,the so called Nusayris. Ashraf, I don't know exactly which cultural similarities you are referring to, but I think most cultural similarities between the two populations can easily be explained as a result of the common Hellenistic, Roman, Byzantine and Ottoman past shared by the two regions. In fact, not just these two regions, but territories of these successive empires as a whole share many cultural similarities (despite geographical/climatic, religious and linguistic differences). I'm impressed by how distinct the Roma linked and non-Roma linked populations are in Albania. The Roma have been in the Balkans since the 15th century with Roma reaching the Balkans in Europe before anyplace else in Europe. These groups have been maintaining population genetic separation from each other for something on the order of 20 generations of approximate co-location, which implies extremely low per generation admixture rates (at least for men), on the order of less than one in a million per generation in a population that isn't very big to start with. This kind of data is useful to calibrate models in places where we don't have direct evidence. If these groups can remain so distinct for so long (in an economy closer to the early European economy than any other in Europe), it argues that models of pre-historic admixture rates should be comfortable assuming that populations can co-exist in the same area for very long times while remaining distinct for a very long time (see also Nilo-Saharan and Afro-Asiatic nomadic pastoralists in East Africa, the Jewish diaspora in Europe v. other ethnicities). What about the Albanian situation (or the other examples) makes it possible for these groups to stay separate as populations while other situations see significant early admixture (e.g. Genghis Khan's golden horde). I don't know if you can extrapolate the Balkans to other areas. I don't want to overreach, but I would say that people of the Southern Pindos, the area that I've observed, have an acute sense of relationship to each other. They can name out to about the fourth or fifth cousin exactly who is related to who. Even descendents who haven't been living there for a generation or so will get a polite inquiry about who they are, who there father and mother is, and then a warm discussion of how that person is related to them. Until quite recently, maybe 1950, marriages were arranged. Marriage is definitely patrilocal. Interestingly, marriage between first counsins is a giant no no. Even marriage to a second cousin is somewhat frowned upon. There seems to have been a situation where marriage occured back and forth between adjacent villages. The book "Eleni" by Nicholas Gage does a nice job of describing traditional customs in a village on the Greek/Albanian border. But be warned, like the people and the politics, it's a tough book. Andrew, non-assimilating diaspora groups seem to have usually been in a minority position wherever they were found before the conquest of the New World. E.g., Jewish and Roma diasporas were usually outnumbered by the much more numerous natives wherever they lived (Ottoman Salonica/Thessaloniki was an exception). Interestingly, marriage between first counsins is a giant no no. Even marriage to a second cousin is somewhat frowned upon. That is a peculiarity of the Balkans. As a Turk with both Balkan and Anatolian roots, I can give you the Turkish example. Among both Anatolian and Balkan Turks, traditionally marriages were arranged, and both communities were traditionally patrilocal. But only among Balkan Turks cousin marriage (until the 7th generation!) was (and still is) traditionally a taboo. Anatolian Turks, on the other hand, traditionally didn't have a cousin marriage taboo, and in fact they frequently married their cousins (even 1st cousins) until recent times (cousin marriages have significantly decreased with modernization). Not just Balkan Turks, but also the other ethnicities of the Balkans traditionally didn't (or rather couldn't) marry their cousins. "The Sephardic Y haplogroup composition in the map has no resemblance to the Iberian compositions at all". Of course. But would we suppose that certain lineages in Iberia derive from them, we should expect a +/- balanced apportion of ALL their lineages and not just G, which btw is probably not the same subclade as in the Western Med (but would need to be tested). "One oddity [among Sephardim?] is the unusually low (for any European and Western Asian population) distribution of the haplogroup I. This is almost certainly due to genetic drift". Haplogroup I, AFAIK, is very low in West Asia. "So the general peasant ratio should be more than 90% (maybe more than 95%) in pre-industrial times". Probably. It may anyhow depend who you read because there are no serious statistics we can rely on. Also as agricultural productivity increased in non-Mediterranean Europe in the High Middle Ages, thanks to the heavy plow, it's probable that peasants could support slightly more "unproductive" people (artisans, traders, artists) per capita, what may well be behind the Renaissance, and ultimately modernity. There was a meaningful increase in agricultural production before industrialization that probably enabled it. However this improvement could never be implemented in the Mediterranean area because soils are much thinner there, what explains, at least in part, the displacement of the center of gravity of Europe from Italy to the Rhine. That's my whole point. I can't include Modernity, much less late Modernity in my previous claim. Anyhow, for peasants moving, they needed somewhere to go: in the British case it was the overseas colonies and the new industrial suburbs, these often not far too away from where the peasants came. This whole situation is very peculiar of industrialization and can't be expanded to any older time. Some, in industrial times, and never left Britain. I never said that "villages are static" but that peasants would not move too far even if displaced. There are also exceptions: localized democides, middle range colonizations, as in medieval Iberia or East Germany, slave trade... but overall the pattern of change was slow and small, too slow and short distance to allow claims of massive population replacements after Neolithic was consolidated. "The archeological site that I am interested in finding out about is Dispilio". No idea about the details but, by the dates and geography, it should be part of the Dimini-Vinca broader cultural area, which spanned through Northern Greece, Macedonia, Serbia and highland Albania, also influencing the Hungaro-Croatian plains. The earliest layers, if the date of 5600 BCE can be confirmed might be of the previous Sesklo-Starcevo macro-group. Albanians, like Greeks, have been labeled by some as being not indigenous. Of course this has been politically motivated. Studies repeatedly show that both peoples are substantially indigenous to the general area. Some uneducated propagandists spread the misinformation that most modern Greeks became Greek around the time of the Greek War of Independence. I got a family tree recently and found that the first recorded ancestor was Greek before the war of independence--and this person was from a region where Greek ancestry was questioned. "Closest ie branch to Albanian could be Celtic". This is mass-lexical comparison. Most linguists would not agree with it. Look what oddities it produce: Latin is closest to Attic Greek and Old English. Also the matrix has too many holes and you can't find "control" comparisons such as Latin to Spanish. Highly doubtful. "This kind of data is useful to calibrate models in places where we don't have direct evidence. If these groups can remain so distinct for so long (in an economy closer to the early European economy than any other in Europe), it argues that models of pre-historic admixture rates should be comfortable assuming that populations can co-exist in the same area for very long times while remaining distinct for a very long time (see also Nilo-Saharan and Afro-Asiatic nomadic pastoralists in East Africa, the Jewish diaspora in Europe v. other ethnicities)". I think that a key is whether the populations in question stay apart and do not assimilate with the mainstream groups. Roma clearly have done that so far by being strongly patriarchal, clannic and culturally different. If they assimilate, as will probably happen in a world where nomads and unqualified workers have no more room, they will dissolve like a sugar cube. In Roman times, Syrians and Greeks were major trader communities, along with Jews, but the two first groups blended with the majority and vanished from sight, while Jews managed to keep their specificity, in this case via a sanctioned, albeit marginal, religion. Most exotic scattered ethnicities have been absorbed, only rarities remain (and not a single one from pre-Roman times - not in Europe nor West Asia). amusing about the 7th cousin taboo. try having the marrying-your-first cousin conversation sometime with someone who is used to this whole cousin taboo. It's like you're suggesting marrying your sister or brother. I read somewhere that it started with Philip II. He figured out that he would never be able to break those annoying out kingdoms and build a nation if they kept intermarrying, so he implemented some kind of you-can't-marry-your cousin edict. I think it's buried somewhere is Peter Green's Macedonia books. I wonder what gives with Tosks having a high percentage of haplogroup I? Could these people be descended from Vlachs? "Also as agricultural productivity increased in non-Mediterranean Europe in the High Middle Ages, thanks to the heavy plow, it's probable that peasants could support slightly more "unproductive" people (artisans, traders, artists) per capita, what may well be behind the Renaissance, and ultimately modernity." The history of the Balkans from antiquity to the Ottoman conquest is surprisingly well documented. Essentially, there is no "Dark Age" in the Balkans, as there was in the West, but an unbroken line, wavering up and down, of Byzantium until 1453. I see from searching Amazon for "Byzantium" that there are now a wealth of books on this formerly forgotten chapter in history. I could never really make sense of the Renaissance or antiquity until that little business of the missing thousand years was filled in for me. "Wealth and Poverty in the Teachings of the Church Fathers" by Father James Thorton, St. John Chrysostom Press, Berkeley, California, 1993. "I wonder what gives with Tosks having a high percentage of haplogroup I?" They are neighbor to other high I (I2a) peoples of the Western Balcans. That's the area where most I2a is anywhere in the world. "Essentially, there is no "Dark Age" in the Balkans". What part of the Balcans? Serbia or Greece? The inland Balcans were "darkaged" too, even if this anglosaxon concept is not really much used elsewhere, here we call that period the Early ("Upper") Middle Age. "Some have argued that the brain drain from the East to the West at this time accounts in part for some of the impetus behind the Italian Renaissance". Sure. But again these people were not from Bulgaria but Constantinople and its provinces. "One of those things you'll never learn from a Western European history book". Oh, yes, we do. You learn that but you learn nothing about Basque history. Curious, eh? "it should be part of the Dimini-Vinca broader cultural area, which spanned through Northern Greece, Macedonia, Serbia and highland Albania, also influencing the Hungaro-Croatian plains." OK. With some influence from Thracians as well, over the top through Serbia. A really long, pre-Homeric, time ago. That sounds about right. In preclassical times, some of them got fed up with the winter, walked southward, down the Central Macedonian plain, intermarried, and turned into Spartans and Boeotians. I've read that the Athenians considered the Boeotians and Spartans to be excruciating dull. They are neighbor to other high I (I2a) peoples of the Western Balcans. That's the area where most I2a is anywhere in the world." No, Maju. The Tosks are neighbors of the Ghegs, Epirotic and Macedonian Greeks, and Macedonian Slavs, with some pockets of Vlachs/Aromanians interspersed among the major populations. The Ghegs are the ones who are neighbors of Montenegrin and Serbian Slavs (and also Macedonian Slavs, too). No Thracians so early (unless you believe in the Renfrew fantasy). Whatever the case, I have already said that what I'd like to know is the differences between coastal and interior Albanians, rather than N/S. Neighbors or not neighbors, anyhow, the Western Balcans are still the largest reservoir of I2a in the world, and the Tosks are clearly in the Western Balcans in any case. The correct question, IMO, is rather why the Geghs are so low on I. Some founder effect maybe but it may be crucial to check local samples rather than rely on dialectic divisions which may obscure rather than clarify things. "What part of the Balcans? Serbia or Greece? The inland Balcans were "darkaged" too, even if this anglosaxon concept is not really much used elsewhere, here we call that period the Early ("Upper") Middle Age." I was hoping not to get drawn into this conversation!! At least until later this week. Let's just say that that there must have been a lot of multilingualism in this area. Justinian, to whom we owe credit for the Codex Justinianus as well as the commissioner of the great cathedral of the Aghia Sophia, is thought to have been born near Skopje. Byzantium didn't really look at the Balkans, all carved up, as today. And they still had the benefit of Roman roads, such as the Via Egnatia, which held the Balkans together to some degree. Most peasants probably never ventured from their villages by more than a hundred miles. At the same time, the administrative center for the Balkans and much of Turkey, was from Constantinople. Following the devastating wars at the end of the classical period (Peloponnesian as well as the implosion following the death of Alexander) Rome swept through within several hundred years. What had been classical Greece, Epiros, Macedonia and Thrace, hunkered down and reappeared as Byzantium by 337AD. My own view is that the theologians of the Early Byzantine period form a continuum with the philosophers of the classical world. But unlike Aritotle or Aristophanes, it wasn't such a funny time anymore. You really had to look people in the face that were starving to death and try to figure out how to build a more just society. In this way, I think that thinkers like St. John Chrysostom and St. Gregory of Nyssa are right up there with Hellenic classical thinkers. The Byzantines . . . totally under-rated. There were also certainly ties with the Levant, Egypt, Italy, southern France. Repeated incursions from the East, as well as internal strife and the effect of the plague, gradually weakened Byzantium from within. So although there were distinct ethnic groups, and many languages, the modern concept of clear nation states simply distorts the understanding of Byzantium. As I said, I'll put up some references for this when I get a chance. Yes, Maju, it's nonsense that they don't teach about the Basques, as well as other ethnically distinct people. On the other hand, I'm fine with ethnic identities held within a greater nation. Having endured about forty years of strife in Canada regarding Quebec, I think that you can teach ethnic identity, but I don't think that the idea of a legal "distinct society" is a good one. "We are all equal, but different" is better than "We are all equal, but some are more equal than others." I'm going to sign off now until Wednesday. I'm supposed to be studying for a French lit test that I have tomorrow night. And I have a presentation I have to do at work tomorrow, and my daughter has dirty fingernails and I should have given her a bath tonight but she fell asleep. But would we suppose that certain lineages in Iberia derive from them, we should expect a +/- balanced apportion of ALL their lineages and not just G, which btw is probably not the same subclade as in the Western Med (but would need to be tested). Yes, that was my point in emphasizing the enormity of genetic differences (at least in Y-DNA) between Iberians and Sephardic Jews. But not that low. The Sephardic Jewish ratio of the Y-DNA haplogroup I is the same as that of North Africans, who have a hg I average of around 1%. West Asians, on the other hand, by average carry around 5% hg I. As the Sephardic Y-DNA haplogroup composition has no resemblance to that of North Africans, their extremely low hg I ratio should be due to genetic drift (entirely expectable in relatively small and isolated populations like Jews). The typical reference is Rootsi 2004 (maybe you have something else?) and your 5% figures only apply to Turkish, Lebanese and most Caucasus peoples, while Jews and Iraqis have around 1%, and Iranians and Georgians seem to be at absolute zero levels. So it seems to be a near-Europe feature and still quite low. Yes, that was also my impression from my conversations with Balkan Turks about cousin marriage. In fact, I myself too have always been instinctively puzzled about cousin marriages because of my upbringing, as my mother's side is entirely composed of Balkan Turks. Dienekesm you write that Albanians having typical Mediterranean Neolithic lineages such as J2b, E1b1b1 and I, "Kinda puts a damper on their Illyrian pretensions". I am not sure why you would see this as an argument for or against anything to do with Illyrians? I am not sure why you would see this as an argument for or against anything to do with Illyrians? Because Illyrians were reckoned to be a northern nation in antiquity, and this isn't very compatible with the predominantly southern composition of their gene pool. Dieneke, we don't know the genetic composition of Illyrians nor the Neolithic inhabitants of present-day Albania. But one thing is for sure: Modern Albanians have an abundant ratio of the probable European Neolithic lineages, irrespective of how much percent of them arrived Albania with the Neolithic or with the first Albanian speakers. I think a considerable ratio of them arrived with the Neolithic and surely the overwhelming majority arrived before the first Albanian-speakers, as the Albanian-speakers most probably came from further north of the Balkans and carried relatively a small ratio of Neolithic lineages. The data is freely available on YHRD, but difficult to retrieve unless you know what to look for. R1a, R1b, and I2a2-Dinaric seem to be concentrated in the northern two data points (out of 4) in Albania. The R1b outnumbers the R1a in a ratio of about 3:1 thanks to the 385a/b 11-11 haplotypes. R1b also had the most number of unique haplotypes. The other study available for Bosnia actually has 5->7/100 (2 are possibly N1) haplotypes that are R1b including the 11-11 cluster. I didn't check on the E-V13 data, but it would likely be concentrated in the southern 2 data points. I suspect in antiquity the pastoralists and farmers lived side by side with minimal integration except to trade. Over thousands of years these barriers have broken down. To a previous poster. The Aromuns have very high amounts of R1b. To the point, R1b looks very native to South East Europe. I2a2-D has a strong association to Western Russia, and NE Europe and is one of the youngest clades existing today...suggesting very quick expansion due to its wide distribution in the general area. "I didn't check on the E-V13 data, but it would likely be concentrated in the southern 2 data points". I'm probably not using the search feature as you do (I'm using SNP search) because I don't get data points but whole populations (Gegh and Tosk, and the two Roma groups). Whatever the case, isn't nearly all Balcanic E, E-V13? AFAIK it is... and therefore we should expect that all or nearly all E1b1b1 in Albania is E-V13... and therefore it is more dense in the North, as it is in Kosovo and Albanian Macedonians (mostly Gegh). "R1a, R1b, and I2a2-Dinaric seem to be concentrated in the northern two data points (out of 4) in Albania". Then what do you think that the Tosk I is? "Sardinian" I2a1? Or maybe some other I2a*? Because what is clear here is that most I is in the south of the country. Or I2a2-"Dinaric" is different from I2a2, a mere haplotype subclade? (Sorry but I'm not sure why the "Dinaric" tag or what exactly means, sounds to FTDNA slang). "The Aromuns have very high amounts of R1b. To the point, R1b looks very native to South East Europe". This is the kind of logic I make no sense of: the Aromanians are a tiny traditionally seminomadic minority who are not more than 300,000 people total and whose origins are totally obscure. How can you extrapolate anything for the whole Balcans from such a tiny group is something I really don't understand. Then also, and for once I'm going to reference to the Balaresque paper for the little it's worth, the Balcans appear very low in R1b1b2 diversity and not central at all. The Balcans do not appear central even for R1b1a, no matter that Italy to their west and West Asia to their east have high diversity. "People of the Southern Pindos, the area that I've observed, have an acute sense of relationship to each other. They can name out to about the fourth or fifth cousin exactly who is related to who. Even descendents who haven't been living there for a generation or so will get a polite inquiry about who they are, who there father and mother is, and then a warm discussion of how that person is related to them." Sounds like the rural communities I go to for family reunions in rural Colorado, Ohio and Michigan. "Until quite recently, maybe 1950, marriages were arranged." My inlaws had an arranged marriage and so did my great-grandparents. The emergence of widespread love marriage is remarkably recent and because it happened in historical times well documented. "Interestingly, marriage between first counsins is a giant no no." This is interesting because by the time you've taken a hope South to another area within the former Islamic empire in rural Iraq, Syria, Jordan and Saudi Arabia, cousin marriage is quite common. "The book "Eleni" by Nicholas Gage does a nice job of describing traditional customs in a village on the Greek/Albanian border. But be warned, like the people and the politics, it's a tough book." Sounds like a book to buy used or get at the library. Maju, the R1b among Aromuns was from a previous study which you can find a reference to from the "YDNA by ethnic group" on Wiki. I only said it was present in high proportions among Aromuns...again you can go reference that data to see for yourself. My conclusion that R1b is old and native to SE Europe is based on the sheer number of unique haplotypes. Many of which are plentiful to the region (but rare elsewhere) such as the 11, 11/10, 11 cluster and R1b DYS393=12 haplotypes which are far rarer in Western Europe. The bulk of the haplotypes I queried from the studies in question were I2a2-Dinaric motif which is a completely different haplotype from I2* or I2a1. I don't understand why you argue every point when people bring direct evidence. "I'm probably not using the search feature as you do (I'm using SNP search) because I don't get data points but whole populations (Gegh and Tosk, and the two Roma groups). " - I only did a quick scan which displays results over the 4 data points including the previous study on YHRD. The I2, R1 data are clustered in the north. Deeper analysis can come later. "Whatever the case, isn't nearly all Balcanic E, E-V13? AFAIK it is... and therefore we should expect that all or nearly all E1b1b1 in Albania is E-V13... and therefore it is more dense in the North, as it is in Kosovo and Albanian Macedonians (mostly Gegh). " -As I said, I only queried R1 and I2 data. I didn't do any analysis on E-V13 haplogroup data. It might also be in the north. I would be interested to see data that is in the south and see if anything could be inferred by that distribution. "Then what do you think that the Tosk I is? "Sardinian" I2a1? Or maybe some other I2a*? Because what is clear here is that most I is in the south of the country. " "This is the kind of logic I make no sense of: the Aromanians are a tiny traditionally seminomadic minority who are not more than 300,000 people total and whose origins are totally obscure. How can you extrapolate anything for the whole Balcans from such a tiny group is something I really don't understand. " -Reverse the question. Is there any logic or reason to believe R1b is not in SE Europe. I do not see any, nor have any studies so far proven that. Levels of ~10% should be expected aside from founder effects that results from a small gene pool or bottleneck. "My conclusion that R1b is old and native to SE Europe is based on the sheer number of unique haplotypes. Many of which are plentiful to the region (but rare elsewhere) such as the 11, 11/10, 11 cluster and R1b DYS393=12 haplotypes which are far rarer in Western Europe". However DYS393=12 R1b1b2* seems also high in diversity in Italy and Portugal (per Argiedude's synthesis) and not particularly diverse in the Balcans (high but comparable or slightly below other southern areas). "The bulk of the haplotypes I queried from the studies in question were I2a2-Dinaric motif which is a completely different haplotype from I2* or I2a1". I don't know what is "Dinaric motiff" nor have been able to see the evidence. Per YHRD and the paper, all is just I (the SNP tested for), though maybe you can tell us from the haplotypes what haplogroup it is (most likely). In any case, you should clarify what the heck is "I2a2-Dinaric" and what's the difference (if any) with other I2a2. It's an obscure claim I don't understand (probably because I'm unfamiliar with your FTDNA slang). 1. Can you tell by SNP that southern I (which is higher) is not mostly I2a2? 2. If not, can you tell from haplotype what other clade it might be? "I don't understand why you argue every point when people bring direct evidence". "I'll take another look tonight. Most of the results were I2a2 from what I could see. I never specifically ran any checks outside that. I saw the frequency was high and stopped there. (With the exception for variations of I2* which returned 0 results)". Ok. Then it's all I2a2, north and south. Clarified, right? What's the difference between regular I2a2 and I2a2-D, because it was that term what caused all my confusion. If I2a2 is fundamentally found in the West Balcans, what does the "Dinaric" tag mean? That is different YSTR haplotype from the I2a2 of Ukraine and that area? If so, does the high I2a2(xI2a2-D) of Southern Albania has any implications, like I2a2 re-gaining chances of originating in that area (newly found higher haplotype diversity) or what? Sorry for the questions but you made a claim that is raising them. "Reverse the question. Is there any logic or reason to believe R1b is not in SE Europe". It is, it does exist, of course. But it's low in frequency and not particularly high in STR diversity, neither in the Mediterranean clade R1b1b2* (ht35) nor much less in the Western clade R1b1b2a1 (ht15). The Balaresque paper (or rather the analysis I did on what could be salvaged from it), strongly suggest that R1b1b2* has an Anatolian center, while R1b1b2a1 has a West European center (not clear where because she placed majority of samples under the "other" category and the diversity levels, per Argiedude again, are all very similar). Of course, the Balcans and Italy "are there" but there's no particular reason to believe they are core areas. Someone should do a serious version of this study, properly locating all samples and analyzing with the phylogeny in mind and not a pet-theory to demonstrate. But I've already cried enough. "The bulk of the haplotypes I queried from the studies in question were I2a2-Dinaric motif which is a completely different haplotype from I2* or I2a1." From what I read recently, someone proposed two Dinaric I's, North and South. Only two markers are different, so some are questioning whether Dinaric I can be separated into North (of the Danube) and South. Maju: I don't see a need to continue this discussion. The I2a2 haplotypes, (the Dinaric labeled ones) are located in the Balkans and Western Russia/Ukraine almost exclusively. There is a noticeable difference between I2a2 and other I2's on several values, the simple ones that come to mind are DYS385a/b. Not only that, but certain I2 subclades are very limited to geography, but R1b1b2 seems to be pan-European, and mostly all of the same haplotype except for a couple differing values. Whatever explanation you give to this does not mean R1b is less centered in SE Europe than any other haplogroup. Especially when various factors likely led to it being over represented in Western Europe. Geography and overall distance/remoteness should be something we can agree on, where as SE Europe is somewhat of a hub. I did make a mistake earlier when I noted 4 datapoints in Albania. The lower two were actually from a study sampling Aromuns. The actually geography/sampling of this latest study is unknown as far as I know. Let's see: I2a2 is a haplogroup, defined by a number of SNPs, namely M423 and L178. It is not a haplotype, which is normally a subset of a haplogroup described only by STR sequences. So I'm not sure if you are talking of ALL I2a2-M423 or just a subclade of it defined by STR markers. AFAIK nearly all Balcanic I is I2a2 (though Rootsi 2004 also located a good deal of I1-M253, specially in Greek Macedonia) so, unless you present some evidence, I have no reason to think it's not the case in all Albania, north and south. If it's not the haplogroup I2a2, then, per Rootsi's findings in neighbor populations, it might be the "Sardinian" clade I2a1 or the "Nordic" clade I1, because these are the only haplogroups detected in the region at meaningful frequencies and particularly among Albanians. So I'd like you clarify your claims and possible conclusions. Can someone who has read the paper tell us what is the percentage of Gypsy element in the overall Albanian population? The distribution among the different areas? The post seems to imply that it's small, but not infinitesimal. The data has been uploaded to yhrd, which has also recently received some Romanian samples, so this is perfect to make an update to my map of R1b1b2 variance. You can see the map in the next link, it's the old version, I'll explain the new results in the next paragraph. In brief, the ht15 map at the top basically remains unchanged. For the ht35 map at the bottom, add a data point for Albania with 0,38, and for Romania with 0,30. The sample size in either was just 11, which is poor. Albanian samples have more than doubled. Albania's ht35 variance is 0,38, the highest by far in any place in West Eurasia. This is based on 11 samples, which is not great. When making this estimate I excluded the distinctive Albanian ht35 cluster 385=11/11, which we know is ht35 thanks to an FTDNA sample of Albanian ancestry, despite having the (typically ht15) modal 393=13. 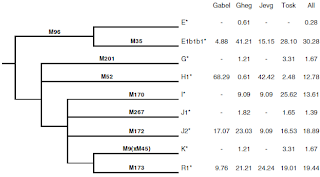 This 11/11 clade is extremely young, its variance is just 0,06. In comparison, Ireland's very young M222 clade has a variance of 0,12. I also noticed another R1b clade with 385=11/11. It has the very exotic modal 392=11, which must be unheard of in R1b, which always has 392=13. And this cluster has the modal 393=12, indicating it's probably ht35, like the other 385=11/11 cluster. So they could be linked. Its variance is also very low, just 0,08, but based on barely 6 samples. 4 samples are from Albania and 2 from Romania. That's pretty much higher than the other high ht35 diversity values. However I understand that with such low samples the precision of this measure is very low and can be very misleading. Still the high diversity of Albanian might be slight support for the Neolithic hypothesis, as it's there with all the other Neolithic Y-DNA package (except G2a). However your maps only allow for one "Neolithic" explanation: via Portuguese Megalithism. Otherwise R1b1b2a1 (ht15) must be Paleolithic and maybe the arrival of high diversity R1b1b2* (ht35) to Portugal is a truly Neolithic founder effect but limited to this area and unrelated to R1b1b2a1 expansion. "... the very exotic modal 392=11, which must be unheard of in R1b, which always has 392=13". Value 14 is also common, specially in ht35 "Turkish" branches. ‘Strabo identified these mountain kingdoms as being of Epirotic stock.’ And that is how the people of this region continue to view themselves today. Music and architecture also strong indicators that this is true. - shows pictures of the village fountain (from a natural spring). YouTube: Nice piece on Albanian iso-polyphonic chanting. A more muted form of this singing is still performed in some villages in the Southern Pindos, including Mount Voion. Unfortunately my PC is out and I am writing from my school. To Argiedude and to Maju I would say that Aromunians come from Rumania, that they aren't only 300,000, as many others were assimilated by the neighboring populations of South Balkans, not only Albanians but also Greeks and others. That they are very close to me (R1b1b2a/L23+/L150+). That Rumanians came, after the Trajan’s conquest, from Italians and Celts-Romans of the Rhine Valley Region. Then their R1b1b2a-s could come from Italy, as well the Portuguese ones, not only at the Roman Empire Time but from the previous Italics-Celts who inhabited Portugal, in fact the Celts-Lusitans are linked with Celts-Italians rather than other Celts. But why Portuguese have a low percentage of R-U152+? Marnie, in an episode of a travel guide documentary (Lonely Planet?) about modern Greece I saw people walking on ashes (in a Christian festival if I remember correctly). Do you have any info about such a tradition in Greece, and which regions and communities engage in this tradition? I think this tradition may have strong pagan roots, as Hindus have the same tradition. It may even be recorded in ancient Greek texts, of course those of us more knowledgeable about ancient Greek texts than me know better. I don't know of this custom (walking on ashes), but I will look into it for you. I haven't run into it in the reading I've done on the Pindos. By the way, I cannot fluently read or speak Greek. My husband can speak and understand Greek, but his written Greek is limited. There are a hundreds of traditions in the Pindos, Epiros, Albania, Macedonia (Greek and otherwise) and Greece that are ancient and have survived because they were incorporated into Orthodox tradition. It would be nice if Dienekes would speak up on this. To Aaron: what I have discovered in the meantime is that your I2a2-dinaric is only one haplotype among several within I2a2 (vide FTDNA), so it's still perfectly possible for southern Albanians to be high in I2a2 and low in the "Dinaric" haplotype. I have never said that I2a2 or I2a2-D evolved in the Balcans, what I have suggested often is that the I2a found in Sardinia, Italy and further west might (only might) have an origin in that area of the Adriatic Balcans, which is at the origin of Cardium Pottery culture (Mediterranean Neolithic). However I may also be wrong. This would independent on whatever origin and migrations I, I2 and I2a would have in Paleolithic times. All it requires is that I2a existed abundantly at the West Balcans at the beginning of CP expansion. Alternatively, as with G2a, I2a1 might have been picked in Italy as the CP wave migrated westward. In fact, if I2a*/I2a1 is non-existent (or very low) in the Balcans (and unless you apply a hyper-short chronology), that's the most probable case. And yet another possibility it's that I2a1 is in SW Europe since deep in the Paleolithic and is pretty much unrelated to I2a2. This also makes good sense. Again, check out polyphonic singing. Compare Albania, Corsica and Sardinia. Also Epirus and some other parts of Greece, where folk polyphony is known to exist among local groups. Also some parts of Germanic Switzerland and Austria. Btw, I don't think there is any relationship between polyphonic singing and certain haplogroups. The idea sounds absurd to me, frankly. no more absurd than using linguistics to augment genetic anthropology. polyphony is highly technical, with very specific forms. until recently, it was only passed on within closely related groups. At least some languages can be related to each other in language families, indicating a relatively recent common past of those languages if not their speakers. On the other hand, folk polyphony, it seems, mostly develops independently in different regions. if we all had another life, we could develop the same sort of syntactic analysis for polyphony as there is for language. at least in the Mediterranean, it is my intuitive guess that polyphony has not developed independently. Why four voices, in most cases? Why is the bottom voice always the ison? On what tone in the ison? Where are the musical stops? What voices sing the counter melody? On these points, there are similarities between Albania, Sardinia and Corsica polyphony. Walking on coals is practiced in some Greek villages in Macedonia (the real one) with a population whose origin is in Thrace. A similar custom is observed in Bulgaria where it is called nestinarstvo, which is the equivalent of the Greek name http://en.wikipedia.org/wiki/Anastenaria, "sighers"). It takes place in the feast of Sts. Constantine and Helen (May 21st). As for polyphonic singing, I'd say it is a fairly recent development to be connected to any haplogroup. I wasn't suggesting a "haplogroup connection" with polyphonic singing, that was onur. But it is hardly unlikely that the Kykerans or Epirotes took their DNA with them as they travelled to other parts of the Mediterranean. "Greece is a country surrounded by water and the sea has always played an important role in its history. The ancient Greeks were active seafarers seeking opportunities for trade and founding new independent cities at coastal sites across the Mediterranean Sea. By the seventh and sixth centuries B.C., Greek colonies and settlements stretched all the way from western Asia Minor to southern Italy, Sicily, North Africa, and even to the coasts of southern France and Spain." As to the age of polyphonic music, I'd say it's old, as old as the origin of the gaida. There is archeological evidence of Neolithic flutes. In the Balkans. I'm not sure about double flutes, but it wouldn't take two flute players playing together very long to discover the musical possibilities of harmonic mixing. The gaida also takes advantage of limited conversion mixing of the melody against the drone, and was probably a refinement which allowed a single player to easily exploit this musical principle. Polyphonic singing uses the same principle and was probably a co-development. No way to prove it in an absolute sense, but it is certainly likely that polyphonic singing existed in the Balkans 3000 years ago. Dieneke, thanks for the links. It is exactly the same event I saw on the TV documentary years ago. "Walking on coals is practiced in some Greek villages in Macedonia (the real one) with a population whose origin is in Thrace." Maybe you, Athenian, could straighten me, married to a Greek Western Macedonian, out on this definition of "real Macedonian"? I'm looking at the data in your paper "Greek autosomal DNA". Yes, there is a slight variation in the DNA of Greeks and FYROM Macedonians, but not much. And how about those plots of Greek Macedonian and FYROM Macedonian DNA? I haven't seen them. I wasn't suggesting a "haplogroup connection" with polyphonic singing, that was onur. Again, check out polyphonic singing. Compare Albania, Corsica and Sardinia." As is clear from these sentences, it was you who first alluded to a haplogroup connection. In fact, my response was a reaction against this allusion of yours. Yes, I2a2, and whatever else was in the Kyrkeran/Epirote DNA mix that may have left for the Mediterranean west. Or are we to assume that if Kyrkerans/Epirotes left Greece, their DNA was non-Kyrkeran/Epirote? I'm not the genetic anthropologist here. The Dinaritic Alps are right there, right next to the Kyrkeran/Epirotes. And Kyrkera is the the closest closing point to Sicily. Maju did say that it was a small amount, as you would expect. So what other Northern Greek DNA made it to Corsica/Sardinia? We could ask that question, instead of parsing infinity. I have no clear idea how to connect music and haplogroups or if this is possible at all but there is an anthropologist who has a full blog (and some papers) dedicated to this matter (Music 000001) and who thinks that polyphony is a remnant of what he calls the Pygmy/Bushmen (P/B) musical pattern, more complex than any other and, in his theory, the oldest of all human musics. While I have some differences (specially how he explains the loss of P/B in large parts of Eurasia) it's still the most consistent theory I have found relating a human cultural item with genetic and archaeological patterns of diffusion. So I feel obliged to mention. Again, it was never my intention to imply a direct connection between polyphony and a specific haplogroup. And again, just so there's no confusion, the Pindos of Albania and Greece are often considered to be the southern extent of the Dinaric Alps. Thanks for the Music 000001 site. I'll check it out. Hah, hah, how every ethnicity on the Balkans thinks they are the only ones to have certain traditions, music, etc. Regarding the polyphonic Folk music Bulgarian singers first became famous around the world with this as the ex communist government sponsored the preservation of “authentic” folklore, while in some other countries everything was commercialised. Compare the “unique” Albanian male choir, with the one from Bansko, Bulgaria, who also think they are the only ones in the world singing like this. Here is a film about Bulgarian nestinari, they actually dance on live amber, not on ashes. This is definitely an old Thracian (but not Greek) pagan tradition, proof like genetics certain things don’t run along government or linguistic boundaries. Also the music the Greek nestinaris dance on is undeniably Slavic, not Greek. yes, as the dancing on ashes thing is Thracian, it's not likely that a Western Macedonian would know much about it. Thanks for the "Star Merak" link. It's beautiful. But not polyphonic. There is a bit of an ison, but no counter singing. "Phonic", but not "poly". As for interesting Bulgarian youtube hits, trolling "Rodopo" is usually good for a surprise or two. This is definitely an old Thracian (but not Greek) pagan tradition, proof like genetics certain things don’t run along government or linguistic boundaries. Also the music the Greek nestinaris dance on is undeniably Slavic, not Greek. You'll have to decide: is it Thracian or Slavic? And, how do you know that it's Thracian and not Greek? Plus how come they have a Greek name if they are of "Slavic" origin. on this definition of "real Macedonian"? A real Macedonian lives in Macedonia (not Paeonia) and speaks Greek. The people who live in Paeonia and speak Slavic are not Macedonians. Genetically, of course, they are related to the real Macedonians (in a European context), but if genetic proximity was a criterion of ethnicity then there would be Greeks galore in all of the Mediterranean and many places besides. Dienekes, I thought it was a clear what I meant. Those people, who lived in Strandja mountain are descendants of the Thracians, but along time some came to speak Slavic, some Greek. The name Nestinari is coming, of course from church Greek as the celebration was switched from Pagan to in honour of the Christian saints Constantine and Elena. In Orthodox tradition most of the church vocabulary is Greek, the same way as in the Catholic countries is Latin. The Rodope mountains may keep some ancient traditions in music, possibly Thracian. It was te mountain of Orpheus, after all. I see no evidence that they were descendants of Thracians, and they were Greek within historical memory. Is there any evidence of a pre-Christian existence of such a custom among ancient Greeks and/or Thracians (or any other pagan ethnicity of the Balkans)? The custom may as well be Christian Greek (or, more accurately, Strandjan Christian Greek) in origin, and may have later been passed on to Strandjan Bulgarians after their conversion to Christianity (as religion was maybe the most utilized medium of cultural transmission). What do you both think? But those regions were inhabited by Thracians well before the first Greek arrivals (from the south). So if the Thracian Greeks are mostly descended from the indigenous people of Thrace, they must mostly be descended from Thracians, who were once in the majority in those regions and who were there well before Greeks. The name of Thrace also attests to a major Thracian presence in Thrace and the surrounding regions in pre-Greek times. Alternatively, firewalking Bulgarians may be directly descended from a group of linguistically Bulgarianized (in a later time) firewalking Christian Greeks. The border has to be put somewhere. That is true. And the written record clearly records at the time of Philip and Alexander, which tribes sided with and against them. I'd have to have another look at Peter Green's book to remind myself of who was a Philip insider, and who was not. - The Carnivale/Ragoutsaria bonfire celebration at Epiphany. - A cheese/egg pita as Vasilopita, instead of the cake version. There is a series of youtube videos made about a village in the Osogovo Mountains that clearly shows Macedonian cultural similarities that span the border. I doubt that any Greek Macedonian or FYROM Macedonian is interested in redrawing the border. But it is poignant that ancient cultural customs are threatened and disappearing on both sides of the border, while the "Macedonian Question" still rages on. This only hurts Greece, ALL of Greece. Do I understand well the Greeks are claiming the Thracians were also a Greek tribe, the same way as with the Ancient Macedonians? This is big news to me as all historians clearly state the Thracians were completely different people not only in language, but tradition and culture. They were usually hostile to the Greeks. However with the spread of the Greek colonies on the Black sea coast (they had some inland, too as the big rivers like Marirtza were navigational in the past) they started passing some cultural influence. Some of the Thracian aristocracy started buying luxury goods of foreign origin and even directly employing Greek artisans to build and decorate their tombs. But this does not make them Greek. Thrace was not Hellenised in ancient time, but it got latinised after it became a Roman province. Only with the switching of the Eastern Roman Empire back to old Greek traditions part of the population started using the Greek language again. They were not ethnic Greeks at all, just converts. Very large part of this played the Greek Orthodox Church by converting the pagans to Christianity. Regarding the firewalking tradition in Strandja, of course there is no proof it is an old Thracian custom. However, it can’t be a Greek CHRISTIAN tradition, as the church at the time was very active in prosecuting any signs of paganism or even sectarianism. It survived only because was practiced in some isolated mountain villages. Here is to say, that many other ethnicities, not just the Greeks and the Slavs had a strong presence in Thrace. At the time it was a part of Bulgaria there settled also the Bulgars, Cumans, Alans, etc steppe ethnicities. When it was a part of the Byzantine Empire they ‘banished’ there Armenians, Georgians and other people from the East. Furthermore, during Ottoman rule the Greek Orthodox Church had much influence and power. It took over most of the old Bulgarian dioceses and introduced again the services in Greek. Most rich and prominent people of other ethnicities tried to pass as Greeks, which gave them some privileges under Ottoman administration. Only at the end of 18 century there was some national revival of the Bulgarian and Macedonian people when they managed to restore the independence of their church and services in Slavic. However some purely Slavic villages, mainly in mixed regions did not go back under Bulgarian church. Since religion, not ethnicity was the main thing recognised by the Ottomans, those under the Greek church were considered Greek, not Bulgarian. This was also the principle of counting the minorities when the new borders were drawn after the Turkish empire disintegrated. I think Greek people have no justification of claiming the Thracian Greeks were actually Greek by blood let alone the traditions and customs not part of Christianity were Greek. However, it can’t be a Greek CHRISTIAN tradition, as the church at the time was very active in prosecuting any signs of paganism or even sectarianism. You still didn't explain why it can't be Greek Orthodox Christian in origin (much less why it must be pagan in origin). Maybe that tradition survived because that it had no pagan or heretical roots and so wasn't prosecuted. It is true that many Thracian tribes were never "hellenised" during the time of classical Hellens. The Battle of Troy appears to have been fought between the Thracians and the Greeks. However, it is also clear that in the southern part of Thrace, by the classical period, the larger part of Thracians had been hellenised, especially the ruling classes. Thucydides, the historian, was a wealthy Athenian noble, but also the son of Olorus, the King of Thrace. He lived between two homes, one in Athens, and the other in Thrace. The reach of Athens during the classical period, and even before, was far greater than people realize. It was commonplace for people to travel back and forth between Athens and Thrace. My view is that the modern border of Thracian Greece and Bulgaria is drawn in about the right place. The focus on the modern location of language really confuses the issue. Also, the focus on whether the language was "Slavic" or "Greek" really confuses the issue. I'd guess that the ancient Thracian and Macedonian languages were an "in between" of a Hellenic and a Slavic language. There really isn't a simple answer with so much history. There isn't much evidence that the early Church deliberately suppressed pantheist believes. There is a long and documented dialogue of theological thinking, over about five hundred years, as theologians worked to incorporate classical and pre-classical beliefs into their world view. There is some evidence of the Church desecrating ancient religious sites. For instance, Saint John Chrysostom is known to have destroyed the temple of Artemis at Ephesus. As an ardent supporter of the disenfranchised, he no doubt got a little carried away in his objection to the opulent wealth that was donated to this temple by the wealthy, while a situation of the most dire poverty engulfed Byzantium. Please read Michael Angold's book on Byzantium. "ssas", what you are suggesting in not in context for the time. onur, virtually every belief held before the Christian period could be argued to be "pagan." Everything we know about the classical world, from Ptolemy to Pindar, from the Panagaia to Demetra, travelled across the bridge of Orthodox monastacism and custom, arriving at the doorstep of the Renaissance. The Orthodox were largely unthreatened by pagan custom and science alike. It's an emblem of their confidence that they amalgamated and synthesized, rather than destroyed, their ancient world. Do I understand well the Greeks are claiming the Thracians were also a Greek tribe, the same way as with the Ancient Macedonians? No, it is YOU who claimed that the custom was Thracian and not Greek, but provided no evidence for your claim. The ancient Thracians were clearly a barbarian people, unlike the ancient Macedonians who were clearly Greeks. However, that does not mean that anything that originated in the region of Thrace is (ethnically) Thracian in origin, as the Greeks also lived in Thrace since very old times, and indeed assimilated the Thracians completely, long before the arrival of the Slavs who co-existed with the Greeks (and later with the Turks) in the geographical region of Thrace. Northern parts of modern Greek Macedonia was ethnically Thracian before being assimilated by the Greeks. But they arrived to the region later than the Thracians. If you mean all of the Thracains regardless of territory, only the most southern ones were Hellenized. More northerly Thracians (e.g., Dacians, Moesians) were never Hellenized and were later largely Romanized/Latinized by the Romans. If you mean only the Thracians of modern Thrace, probably most of them were Hellenized (the rest were Romanized) before the arrival of Slavs. As far as I know, Balkan and Anatolian Thracians had been completely assimilated by the Romans and Greeks before the arival of the Slavs. Your point is irrelevant as I wrote of ancient Macedonians, not ancient inhabitants of Macedonia. Of course there were non-Macedonians who lived in the territory of Macedonia, but the Macedonians were Greeks. But at least a couple of millennia before the custom in question is first attested, hence there is no specific reason to believe that it is of "Thracian" origin. It's like saying that a particular custom found in modern-day Konya is "Phrygian", just because Konya is where the Phrygians used to live. No, the custom might be pre-Phrygian, or Phrygian, or Greek, or ,..., or Turkish in origin. That is a terminological quibble which depends on whether one considers the Dacians as Thracians, which was certainly not the case in antiquity. But, I have no problem with the idea that some Thracians were assimilated by the Latins. Why isn't anything happening in the senate? the barbarians have not come. And now, what's going to happen to us without barbarians? Oh, my mistake. Sorry for the confusion. That is a terminological quibble which depends on whether one considers the Dacians as Thracians, which was certainly not the case in antiquity. Ancient Greek and Roman writers often equated or at least associated them. But demographics of ancient Dacia has little relevance to our discussion about Thrace and its firewalking custom, so let's stop discussing Dacia and focus on Thrace. Marnie, are you going to deny this traditional singing among Shops in Western Bulgaria is not real polyphony? Unfortunately nowadays only a few “babi”(grandmothers) can master this way of singing. The young girls would like to sing like Lady Gaga. How wonderfully exasperating you are! I've heard popularized versions of this, but it's nice to see the real thing. - the dress. Here, the dress is different in the style of the embroidery pattern on the sleeves, from a Macedonian. It's more geometric and is in a single color (red). The head coverings, here very fun, are somewhat different from a Western Macedonian. There's some differences here, but still the belt hold, and fast, intricate dancing. The dancing that I'm used to seeing in Western Macedonia is slower, with less intricate steps, and with a hand(not belt) hold, like in the Albanian isopolyphony youtube flick I put up. Thank very much, ssas, for taking the time to hunt this down. And yes, it would be nice if there was an organization that would take these traditions on, and hand them down. Don't know if you're at all still following this thread, but your comments about R1b being of SE European origin seem worthy of further investigation, in my mind. It would be nice to see a detailed genetic study of Vlachs vs. the Sarakatsani. The Sarakatsani do *not* consider themselves to be Vlachs, but like the Vlachs, within memory, they were a transhumant people. Furthermore, it would be interesting to run a genetic comparison of Vlachs vs. Sarakatsani vs. the Laz people of turkey. It would have to be a careful study, using known family relationships, and not a blind study of a geographic area. I also checked to see if there are any genetic studies on the Sarakatsani. Apparently, there are, but I can't delineate the Y-dna haplogroup data. I also checked the Vlach and Sarakatsani wiki pages. As far as I can make out, only 3 out of about a hundred Vlach last names start with the Kara or Ka- prefix. On the Sarakatsani wiki page, about half of men who identify themselves as such, carry the Kara- or similar prefix on the front of their names. Certainly, Kara- prefixed names are extremely common in the villages of Mount Voion . . . Karayiannis, Karanicolas, Karathodorus, Karatasos, Karathanasis. Kara is also a given Ottoman prefix and appears in other parts of Greece, but for whatever reason, the Sarakatsani seem to have often taken this prefix on their names. Y haplogroup E1b1b (E-M35) in the modern Balkan population is dominated by its sub-clade E1b1b1a (E-M78) and specifically by the most common European sub-clade of E-M78, E-V13. The area in and around Albanian speaking regions has the highest known percentages E-V13 in the world, and it is thought that the majority of E-V13 in Europe and elsewhere descend from a common ancestor who lived in the Balkans in the late Mesolithic or Neolithic, and that men of this lineage began to spread outside the Balkans as early as the Neolithic, or even as recently as the Roman era. In contrast, another major discovery relevant to the study of E-V13 origins was the announcement in Lacan et al. (2011) that a 7000 year old skeleton in a Neolithic context in a Spanish funeral cave, was an E-V13 man. (The other specimens tested from the same site were in haplogroup G2a, which has been found in Neolithic contexts throughout Europe.) Using 7 STR markers, this specimen was identified as being similar to modern individuals tested in Albania, Bosnia, Greece, Corsica, and Provence. The authors therefore proposed that, whether or not the modern distribution of E-V13 of today is a result of more recent events, E-V13 was already in Europe within the Neolithic, carried by early farmers from the Eastern Mediterranean to the Western Mediterranean, much earlier than the Bronze age. It appeared identical at the seven markers tested to five Albanian, two Bosnian, one Greek, one Italian, one Sicilian, two Corsican, and two Provence French samples and are thus placed on the same node of the E1b1b1a1b-V13 network as eastern, central, and western Mediterranean haplotypes (Fig. S1). If we carefully look at the map and the highest percentages of E-V13, We can see that on the most areas where current ethnic Albanians live E-V13 has its highest percentages, Kosovo Albanians 47.5%, Albanians from Macedonia 39.1%, south Greece 43.5% (were ethnic Albanians called Arvanitas or Arberesh live), north Greece 35.4%, Arvanitas and Peloponnese area 47%% (it is known that Arvanitas lived in Peloponnese area too), and Albania with 27.5%. While the rest of the Greece (were traditionally is known that no Albanians live there) as of those from Crete have only 8.8%, Thrace 19%, and the rest of Greece overall, ethnic Greeks of today have only 19%, it also shows that greeks are much more Slavicized than Albanians with R1a 16%. Also more mixed with I2a 19% (Sardinia, Dalmatia). In addition, based on a map shown with a percentage of E-V13, south Serbia (were ethnic Albanians live) has higher percentage of E-V13, and south east and north east part of Montenegro (were ethnic Albanians live) have also higher percentage. I did read every single line you guys said, and i see some things very very very Blur . In today's albanian archeologic facts , you can still read LINES and spell them very well as it was written today , and those things still have the same meaning . You cannot study things by books , you should go there and see facts . And by the way, Albanians are , probably the only people in planet who know at least 20 names of their family tree (name of father, name of grand father, name of grand-grand father and more) . And if you ask an albanian guy, you'll notice that the 20'th or 19'th name is typical name. Not a Latin or Greek name. Troy: Greek: Τροία(Trea). The word comes from the Greek verb τιτρώσκω(titrosko) which means "to corrupt, to impale, to deflower"(Greek: φθείρω, διαπερνώ, διακορεύω).